Logistical difficulties overcome at the Macron ahead of kick-off against WBA. 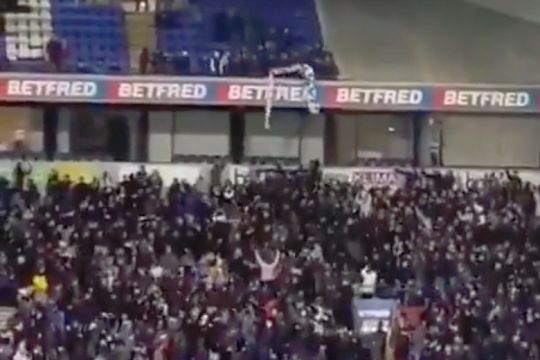 Bolton fans in the stands for a game against West Brom at the Macron on Monday night were cheering as an ‘Anderson Out’ protest banner was thrown up to the upper tier from supporters below. The home fans made their voices heard before, after and during the game in a protest organised against the current club ownership. Kick-off in the televised match on Sky Sports had to be delayed when a considerable amount of tennis balls were thrown onto the pitch. The crowd watched the homemade banner, that looked like it was made out of a cotton sheet, being prepared for the throw and were delighted when it reached its intended target.